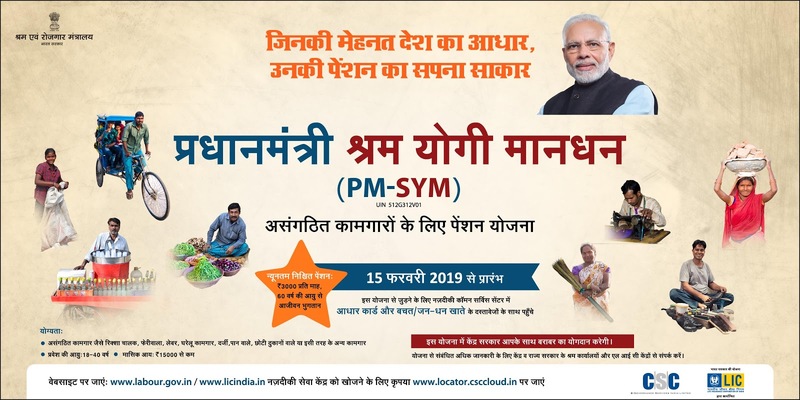 The government of India has introduced a pension scheme for unorganized workers namely Pradhan Mantri Shram Yogi Maan-dhan (PM-SYM) to ensure old age protection for Unorganised Workers. The unorganized workers mostly engaged as home-based workers, street vendors, mid-day meal workers, head loaders, brick kiln workers, cobblers, rag pickers, domestic workers, washermen, rickshaw pullers, landless labourers, own account workers, agricultural workers, construction workers, beedi workers, handloom workers, leather workers, audio-visual workers and similar other occupations whose monthly income is Rs 15,000/ per month or less and belong to the entry age group of 18-40 years. They should not be covered under the New Pension Scheme (NPS), Employees’ State Insurance Corporation (ESIC) scheme or Employees’ Provident Fund Organisation (EPFO). Further, he/she should not be an income taxpayer. 0 Response to "labour.gov.in - Pradhan Mantri Shram Yogi Maan-dhan (PMSYM) Online Registration"